This article was published in Salt Magazine in 1976, the same year St. Mary’s in Chicago closed. In it, author Mary Herlihy, BVM traces the history and impact of Chicago’s first Catholic high school for women. “Old St. Mary’s—the alma mater of many of the pioneer women of Chicago”—so said the Chicago Tribune of February 14, 1925. In days when time moved slowly, the twenty-five years of silver jubilee was long life for a precedent-setting venture in the young city. But St. Mary’s lived on through another half century to become a proud diamond jubilarian. She grew and changed along with Chicago, and now her task is done. 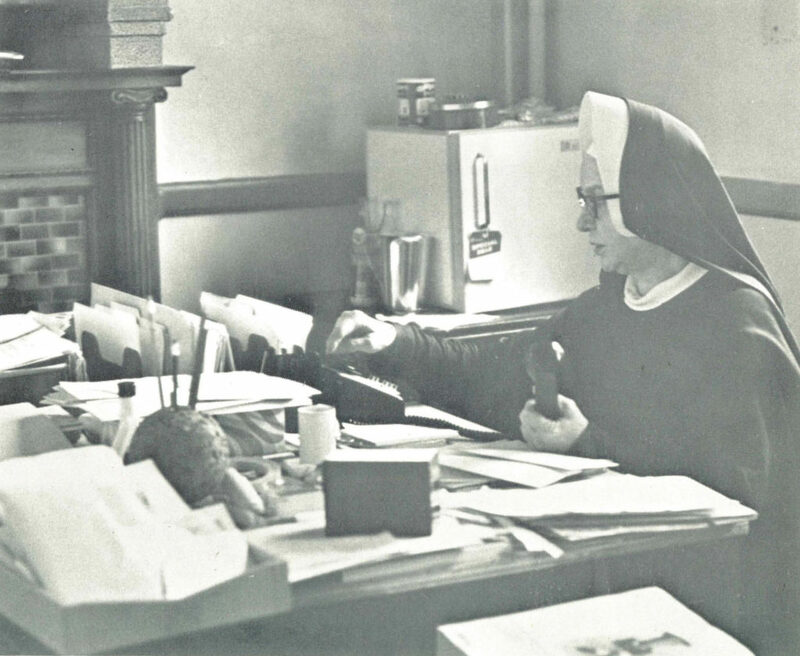 Sister Mary Clarence Hackler gets student transcripts ready for transfer to the University of Illinois at Chicago Circle. Class pictures, archival materials and academic records will also be housed at the University whose field archivist felt that recognition should be given to St. Mary’s historical contribution to the development of the West Side of Chicago. Addressing the graduating class of 1922, George Cardinal Mundelein, Archbishop of Chicago, made the following observations. “When I came here from the East some years ago (1915), I was unfamiliar with this type of school. We had academies. . . . But when I came here, I found St. Mary’s High School, a school where girls of all classes meet on equal footing, where the only aristocracy is the aristocracy of brains. The methods of this institution are marked by briskness of attack. The girls are prepared for active service in the school, in commercial life, and in the home. The place neither gives nor asks odds of any other institution. You people may not know this, but it is due to the faculty of St. Mary’s and of similar schools that admission to the Normal (Teachers’ College) for years has been based on the results of competitive examination, and not a percentage from the schools. They have used their personal efforts with those who had the decision in these matters to secure this result. “They have stood for the principle that the student should prove her right to admission by her ability solely. The faculty of this school have not only not feared, they have challenged competition. “They have practiced the utmost self-sacrifice, and they have instilled the same spirit into their pupils. For some time past, the girls and the sisters here have needed recreational facilities, yet they have cheerfully yielded to the demands of the younger institution, the Immaculata. It reminds one of an older sister who, where there is a pretty little girl in the house, gives up everything to make the little one as attractive as possible. St. Mary’s came into existence in a brave effort to respond to the pressing need of Catholic parents on the South and West Sides for a Catholic education beyond eighth grade for their daughters. This education had been available for some years in boarding academies, but the majority of Chicago Catholics, for the most part immigrants, could not afford the expense. Some pastors, aware of the need, had added high school grades to the parish schools, but funds were scarce and the few parish high schools had been discontinued or were on the verge of closing by 1899. One day, Fr. James Curran, SJ., supervisor of the Holy Family schools, came to the office of Sr. Mary Hilary at St. Aloysius Grade School. As they discussed the problem of the eighth grade girls’ education, he said that he wished the Sisters of Charity of the Blessed Virgin Mary would build a school for the girls as the Jesuits had built St. Ignatius in 1870 for the boys. Sr. Mary Hilary reminded him that the congregation was poor and had just assumed an immense debt to erect the Motherhouse at Mount Carmel in Dubuque, Iowa. However, Sr. Mary Hilary did suggest that they might test the feasibility of such a venture by renting a building to try out the central-high-school plan for a year. This suggestion pleased Fr. Curran, who urged that she put the plan before the Mother General and her council as soon as possible. Subsequently, with permission granted, Sr. Mary Hilary was told to take the initiative, seek a location, and rent a building. She and four companions (S.M. Christiana Brown, S.M. Columba Donnelly, S.M. James Mellow and S.M. Aquilina Jess) established St. Mary’s at the corner of Taylor and Cypress in a three-story building originally intended for a store. The first students—72 of them—filled that space and the next step was to erect a permanent building—two-story, brick, with accommodations for 300 pupils-at 1031 Cypress on property the BVMs purchased. On the feast of the Presentation, November 21, 1900, the freshmen and sophomores moved into the new St. Mary’s. By 1902 the demand became so great that a commercial department was opened. By 1903 enrollment had so increased that a third story was added to the school. This year saw the graduation of the charter class of 18 members. As the need for the education of Chicago Catholic girls increased, so St. Mary’s grew. In 1911 another large building was added. By 1915 registration had reached 600; in 1917 at least 47 Chicago parishes were represented in the student body. The final building, including an auditorium seating 1100, brought the physical plant to completion in the Silver Jubilee year, 1924-1925. Building added to building was clear evidence of the need for what St. Mary’s had to give. But much more than bricks and mortar went into the making of the Mary’s spirit and the St. Mary’s tradition. Changing student needs called for new educational approaches. of Illinois, and to the city of Chicago, one of the greatest in the world, with its unlimited wealth and the best educational system and equipment in America.” In the same address, Fr. Pernin added: “They accepted the trend of the times. They knew that the women of Chicago were no longer to be the sheltered creatures of years gone by. They realized that many of these children must go forth into the world and take their places in business on equal footings with men. They provided an education that would prepare for the battle of life. 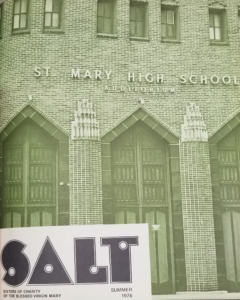 They followed two parallel streams, cultural and commercial, and they have succeeded in both.” Besides preparing hundreds of graduates to fill clerical and secretarial positions in the business world, St. Mary’s became noted for educating a continuing line of prospective teachers for the growing Chicago public schools. In 1915, 500 from all Chicago schools took the Teachers’ Normal College examinations, with 200 passing. By comparison with these figures, St. Mary’s students were remarkably successful-40 of the 41 from St. Mary’s passed. In 1912, St. Mary’s became a chartered institution, fully accredited to the State University of Illinois, the Catholic University of America, and Teachers’ Normal College. In 1933 the school became a full member of the North Central Association of High Schools and Colleges. At the peak of her growth between 1926 and 1929, the number of students ranged between 900 and 950. Enrollment dropped for a time as a result of the depression and also because of the openings of Mercy High School on the South Side, Providence High School on the West Side and lmmaculata High School on the North Side. However, after 1936 there was an increase in enrollment. In 1940 there were 685 students from nearly 100 parishes, 35 sisters and three lay teachers. The 1950’s saw increasing college preparation by a growing number of students. Since its founding, change has been a part of the St. Mary’s scene. Cypress Street became Hoyne Avenue, Robey Street became Darnen Avenue, streetcars gave way to buses, and St. Mary’s address became 2044 W. Grenshaw. As the surrounding neighborhood ran down in the course of time, residents and shopkeepers moved on, leaving empty buildings to decay. The next big change was the closing of St. Charles school, followed by the razing of the once-magnificent St. Charles Church. There were changes within St. Mary’s also to accommodate the needs of a new type of student in the 1960’s. School uniforms disappeared, the sisters first modified their habits, then, with few exceptions, chose to wear simple lay dress. Then, too, an accelerated exodus of Chicago families to the suburbs radically changed neighborhood patterns, and St. Mary’s became part of the Inner City. Once again St. Mary’s accepted the challenge of change and prepared to meet the needs of new students. 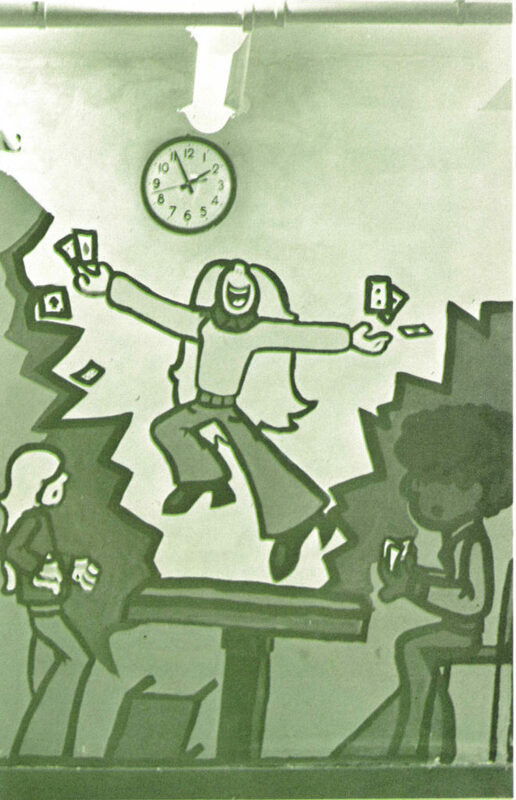 In 1968 the curriculum was completely restructured and an informal classroom atmosphere was encouraged, with a broader choice of subjects, and bold splashes of color in rooms and corridors. Praise for this new program came from educators across the country. But the spirit had to face the hard reality of finance. The expense of salaries for the large number of lay faculty plus the cost of maintaining very old buildings became a greater burden that the BVMs could any longer bear alone. When outside funding did not materialize, they had to give up administration of the school. In September, 1973, the school opened for the first time under other auspices. It was operated as St. Mary Center for Learning by a private corporation, through a Land Trust Agreement with the BVM Congregation. Effective August 1 1973, the University of Illinois Medical Center leased the’ convent, built by the St. Mary’s Alumnae in 1958, for the recently established School of Public Health. The surrounding neighborhood, by then almost thoroughly blighted, was replaced gradually by the concrete and glass buildings of the growing Medical Center. 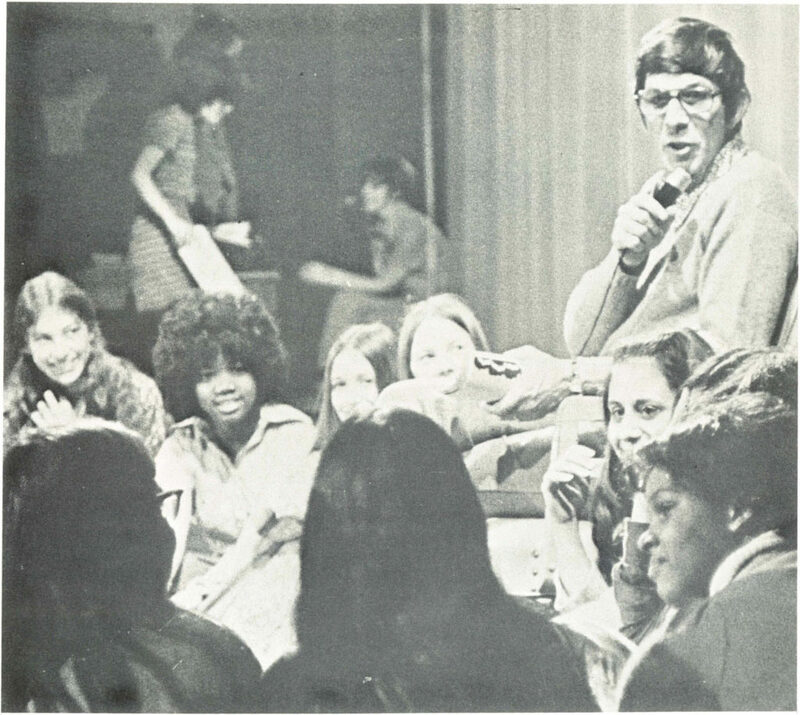 The continuing loyalty of the St. Mary’s Alumnae was never more evident than on November 4, 1973, when they celebrated St. Mary’s Diamond Jubilee. There were many memories of teachers long gone and memories shared with teachers and classmates at the celebration. There was also gratitude for the sharing of themselves and the sacrifices of “the nuns,” sacrifices which the alumnae could not realize or sufficiently appreciate at the time. Leonard Nimoy of Star Trek fame discusses educational values with students. Even during the bare depression years, St. Mary’s provided much enrichment. Outside the classroom routine, there was a newspaper-St. Mary’s Herald-started in 1930•; there were also the orchestra, the band, interscholastic debate, basketball, drama, glee club, and operettas. All of these activities supple? 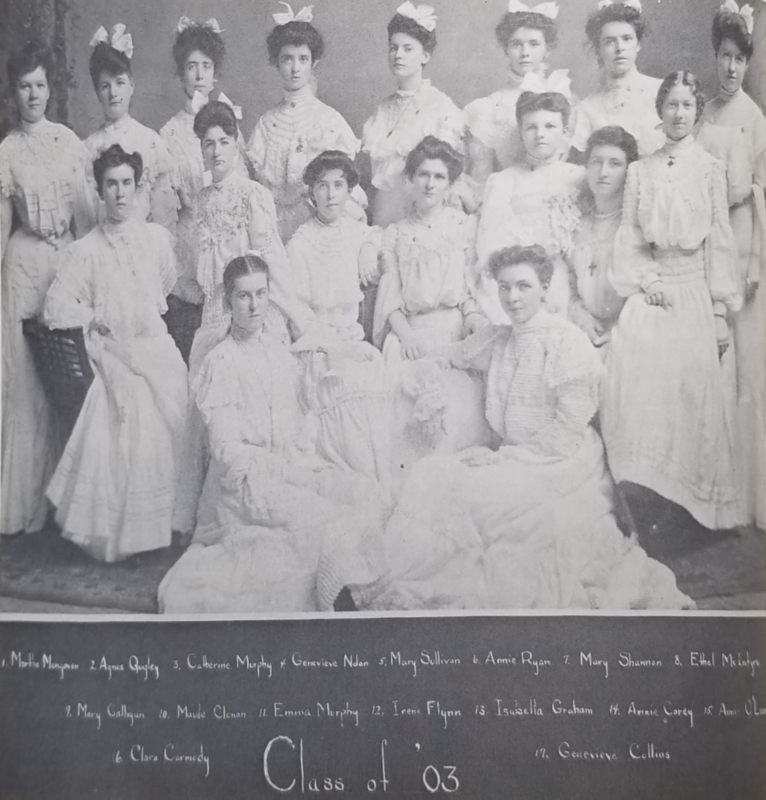 1ented a currriculum which prepared many graduates for immediate employment in business offices, others for higher education and the various professions, and all for a life much ncher for association with cultured, educated, self-sacrificing women who were committed to preparing future generations for fruitful Christian womanhood in the mainstream of American life. The monetary proceeds of the Diamond Jubilee celebration Went to Mount Carmel to defray the cost of a centralized food service for Marian Hall, the congregation’s infirmary, which has been home for many former St. Mary’s teachers and alumnae over the years. For three years the St. Mary Center for Learning has strived to provide quality education to meet the needs of new students in a changing Chicago. But the time has come for another dedicated group of educators to make the hard decision to close. Though the school received national publicity for its innovative program, the Corporate Board voted unanimously on April 1 to cease operation of the private high school in June 1, at the close of the present school year. Present students have been aided in finding enrollment in suitable programs in other schools. Juniors who had sufficient credits were graduated in June. Though the bricks and mortar of St. Mary’s may go the way of other loved stepping stones to the future, the St. Mary’s spirit will continue for generations to be a vital element in the colorful mix that makes Chicago great. It will live in the families, the classrooms, the offices of the more than 9,000 “St. Mary’s girls” who call her Alma Mater. Sister Mary Herlihy is on the faculty of Carmel High School in Mundelein, Illinois.